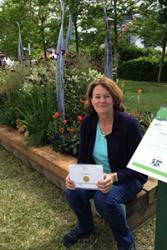 Lisa with her Gold MedalA BSc Hons Agricultural Botany alumna recently took part in the Royal Horticultural Society Flower Show at BBC Gardeners’ World live and won a Gold Medal. Lisa Niemy entered the ‘Beautiful Borders 2015’ category with her ‘Forge Ahead’ creation. The theme for this year’s borders was ‘Industrial Heritage of the West Midlands’ which captured the imaginations of the designers, leading to strong use of materials, clever planting schemes and inspired use of colour palette. During the period of massive industrial development in the West Midlands between 1730 and early 1900, a number of poets described the noise and heat of the fires and furnaces which produced machinery, agricultural tools, ironwork and jewellery. Lisa’s planting reflected the volcanic energy and drama of the forges, whilst the blacksmith's anvil, tools and coal illustrate the important role these items played in developing the legacy of the West Midlands. Originally from The Isle of Man, Lisa graduated from Bangor in 1982 and now runs a successful garden design company, Beautiful Borders, based in Bramley, Surrey.